The New York City mayoral election of 2005 occurred on Tuesday November 8, 2005, with incumbent Republican mayor Michael Bloomberg soundly defeating former Bronx borough president Fernando Ferrer, the Democratic nominee. They also faced several third party candidates. As of 2018, this is the last time a Republican was elected mayor of New York City. Bloomberg would leave the Republican Party in 2008 and register as an independent. However he was re-nominated by the Republican Party in 2009. 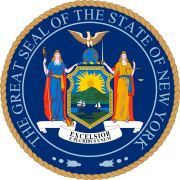 Bloomberg's 2001 opponent Mark Green did not participate in the 2005 race in preparation for a run, which he lost, for Democratic nomination for New York state attorney general in 2006. On April 17, 2005, former Nebraska Senator and president of New School University Bob Kerrey briefly considered a mayoral run against Mayor Michael Bloomberg. However, by April 20, Senator Kerrey decided not to challenge Bloomberg. The first television ads were launched in English and Spanish by the Bloomberg campaign on May 18. On May 28, the Independence Party endorsed Michael Bloomberg for re-election. Due to electoral fusion, Mayor Bloomberg ran on the Independence Party and Liberal Party lines in November. Issues in the 2005 mayoral race included education, taxes, crime, transportation, public housing, homeland security funding and the city budget. One prominent issue throughout 2005 was New York's bid for the 2012 Olympic Games as New York City was one of the finalists to serve as host city. On June 6, the planned West Side Stadium was defeated by the Public Authorities Control Board when Assembly Speaker Sheldon Silver and State Senate Majority Leader Joseph Bruno refused to vote for it. As a result, the new Mets ballpark, later Citi Field, had been supported by Mayor Bloomberg as the centerpiece of the revised bid. On July 6, the IOC awarded London with the 2012 Summer Olympics. In July, mayoral candidates filed nominating petitions with the City Board of Elections. Republican candidate Steve Shaw was unable to obtain the required 7,500 sigatures necessary to be on the primary ballot in September and dropped out of the race. Tom Ognibene, a Republican candidate, was unable to obtain the necessary 7,500 signatures of registered voters to appear on the Republican primary ballot; however, he could still run on the Conservative Party line. On August 3, Fernando Ferrer began running campaign advertisements. On August 12, the Gifford Miller campaign launched their own television ads. The Democratic candidates held their first debate on August 16. The Anthony Weiner campaign launched television ads on August 19, the same day voter registration for the primary elections ended. The Democratic candidates held their second televised debate on August 21; the live debate was sponsored by WCBS and the New York Times. On August 25, a federal judge refused to allow Tom Ognibene on Republican ballot. On September 1, Fernando Ferrer was endorsed by City Comptroller William C. Thompson and ACORN. On September 3, the New York Times endorsed Ferrer in the Democratic primary. The Democratic candidates held two final debates with the first on WNBC on September 7 and on WABC on September 8. On September 10, Reverend Al Sharpton endorsed Ferrer. The Democratic primary was held on Tuesday, September 13 with initial returns showing Fernando Ferrer receiving 39.95% of the votes, just short of the 40% needed to avoid a run-off with second-place Anthony Weiner. Despite at first seeming poised to continue, the next morning Anthony Weiner conceded the election to Fernando Ferrer. However, the city election board insisted on proceeding with a $12 million election scheduled for Tuesday September 27, with an additional debate even planned. This prompted a lawsuit supported by both candidates to prevent the election, the circumstance of which was avoided by a final count giving Ferrer just slightly over 40% of the vote. After winning the Democratic nomination, Ferrer was endorsed by Senators Charles Schumer and Hillary Clinton on September 16. On September 19, Ferrer received the endorsement of SEIU Local 1199, former mayor David Dinkins on September 23 and Andrew Cuomo on September 29. Ferrer was endorsed by the Working Families Party on September 27 but did not appear on the Working Families Party line in November. Prior to the primary, Ferrer was endorsed by New York state attorney general Eliot Spitzer, Carl McCall, Geraldine Ferraro, Sheldon Silver, the Transport Workers Union, current Bronx borough president Adolfo Carrión, Jr. and Ruth Messinger. Ferrer was also endorsed by Representatives Joseph Crowley, Gregory W. Meeks, Major Owens, José Serrano, Ed Towns and Nydia Velázquez. On October 6, a mayoral debate was held at the Apollo Theater from 7:00 p.m. to 8:30 p.m. with Fernando Ferrer and Tom Ognibene; Mayor Michael Bloomberg was absent. The last day for voter registration for the general election was October 14, 2005. The first mayoral debate between Fernando Ferrer and Mike Bloomberg was held on October 30 and broadcast on WABC. Ferrer and Bloomberg debated each other again on November 1 at a debate sponsored by WNBC and the New York City Campaign Finance Board. The general election was held on Tuesday, November 8. Members of the New York City Council as well as the offices of borough president, city comptroller, public advocate and district attorney were also up for election. At 10:30 p.m. on November 8, Fernando Ferrer conceded the election to Michael Bloomberg in a speech at the Waldorf-Astoria hotel. Bloomberg was sworn in for a second term on Sunday January 1, 2006. Tom Ognibene - former Queens City Councilman (1992-2002) and Republican minority leader who supported tax cuts, education reform and opposed Mayor Bloomberg's smoking ban. Ognibene was endorsed by the leaders of the Queens County Republican Committee on February 10, 2005 and was expected to win the endorsement of the Conservative Party . He received 8,100 signatures, 600 more than the necessary 7,500 signatures to appear on the primary ballot. However, the Bloomberg campaign challenged many signatures, leaving Ognibene with 5,848 eligible signatures. Ognibene ran as the Conservative Party nominee. He challenged the Republican nomination in a hearing on Thursday, August 25.  but lost. Anthony Gronowicz - Green Party candidate, and history professor at Borough of Manhattan College, who sought to strengthen affordable housing, supported renewable sources of energy and sought to provide free tuition to City University of New York. He was featured in articles on third party candidates in The Village Voice  and in The Villager in 2005. Jimmy McMillan - a candidate who is recognized by the City Board of Elections . The party platform calls for the creation of millions of jobs, reform of City Hall and support of rent reduction. Kevin Finnegan - a candidate for the Working Families Party according to this list. Theo Chino - Green Party candidate who opposed the West Side Stadium and sought to expand teacher training, free tuition to City University of New York and reforming homeless shelters. His collected petition signatures were challenged and defeated, dropping him from the race in September. Andy Horwitz - a candidate of the Blog Party who sought affordable housing and jobs. His campaign officially ended on September 27. Seth Blum - a candidate of the Education Party, which appeared on the general election ballot.